Three Rooms Press, 9781941110010, 120pp. 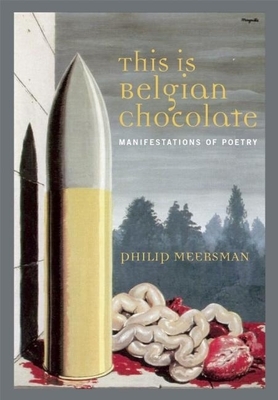 The extraordinary work of poet Philip Meersman is well known in his native Belgium and throughout Western Europe. His work has been described as "overwhelming and wonderful" with a style that permits the concept of an international language underlying his strong antiwar stance. With This Is Belgian Chocolate, Meersman's work is at last collected and presented in a gorgeous volume for a wider audience. Visual poems receive typographic treatments reminiscent of the work of Russian constructivist typographer El Lissitzky. With frequent humorous touches, the work flows across the page in a thoroughly enjoyable, original style. Meersman translates sound into verse and verse into sound, creating an incredible experiential form that is a pleasurable, immersive read. Multilingual poet/performer Philip Meersman pushes boundaries of poetry in both written and spoken form, drawing on current affairs, sociopolitical and environmental issues. His poems range from narrative and traditional form, to directives for performance pieces, to concrete studies of sound, individual words and even letters themselves. His work has been performed in more than 11 countries and translated into 13 languages. He is a cofounder of DAstrugistenDa, artiestencollectief JA!, BurSlam, and the president of BAAZ (Belgische Afdeling van de (Internationale) Zaum Academie). Meersman studied archeology and art history and lives in Jette, Belgium.